Antique is founded on great coffee & food and the desire to make a difference. We seek to use our position and resources to support and assist social justice causes. If you have experience in café/restaurant industry, we would love to talk to you about joining the work we do. 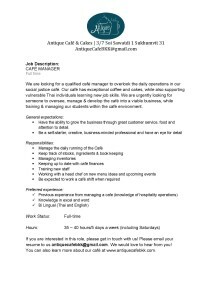 Antique Café is currently hiring for the positions listed below, please inquire further at antiquecafebkk@gmail.com to join our team!